To be rather than seeming to be!! Every politician seeking political office in Ghana and Africa as a whole should be required to read this book before entering the political arena. The author of this book does not mince words, he is blunt and honest about the state of affairs in Ghana and the African continent. The author talks about the real cancer within Ghana politics and public service without sugar coating anything. The author does not only lash out at the stakeholders in Ghana and Africa as a whole, he offers practical solutions that will help alleviate poverty and encourage a result oriented society, where politicians and public servants will be answerable and accountable to the masses. 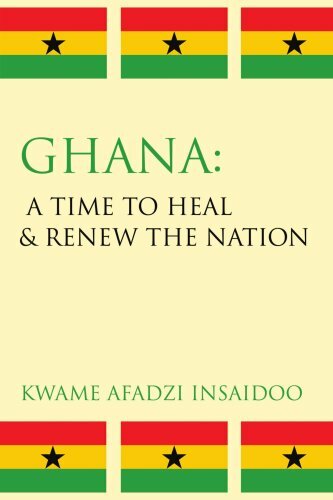 Every high school student in Ghana and Africa should have a copy of this book, because as future leaders they should not be deprived of the truth, that is if they want to see their country transform and develop. Oprah Winfrey, Bono, Bill Gates,Alicia Keyes,Barrack Obama, the U.S. government, European governments and all kind hearted people around the world can throw money at Ghana and Africa but if the people don't find it within themselves to change their attitudes, it would be a waste of time, resources and effort. I have said on many occassions that " sending mosquito nets to fight malaria is a noble cause, but if the remote problem and cause of malaria,the exposed garbage dumps and stagnant ponds which serve as mosquito breeding grounds are not tackled"
I am on a crusade to get all Africans and persons who advocate for African development to read this book.